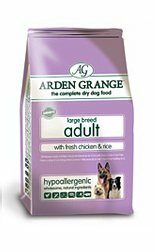 Large kibble size perfect for large and giant breeds. Boosted levels of glucosamine, chondroitin and MSM to help maintain supple, strong joints and cartilage. Fresh chicken and A grade chicken meal 0co meat protein of the highest biological value. Added fish oil 0co a rich natural source of Omega 3 fatty acids. Added L Carnitine may help to improve endurance and stamina by increasing the conversion of fat to energy. May also be fed to smaller breeds who prefer a larger kibble size.